How to install and use Piezography ink on the 7600 & 9600. Use these procedures to convert your color printer to a Piezography printer. If you are installing user refillable cartridges, please refer to the installation instructions provided with the refillable cartridges. Whether you use refillable cartridges, CIS, or pre-filled cartridges (available outside the USA), the placement of the shades of Piezography ink are critical and not arbitrary. You must refer to the shade location table provided here on this document. A Piezography system depends upon software with which to control the ink shades. Installation instructions and support of that software is provided by the manufacturers of those software. We provide our own guides to our suggested use of QuadTone RIP, so that you can get the best results from that product. A set of ink cartridges; a set of flush cartridges (if used); an eighth cartridge, either ink or flush fluid for the Photo Black slot; a spare maintenance tank (available through Epson), or a large format cartridge and waste tank chip resetter; The black position “draining” cartridge that came with your printer may be needed, depending on your situation (see below). Background on the 7600 and 7600 printers and black position cartridges: Two separate cycles are needed to switch inks in these printers. The required cycle depends on the type of black cartridge you are switching from and the type of black cartridge you are switching to. If you are switching from a Photo black to matte black cartridge, or from a matte black to Photo black cartridge, you must use a black ink change cycle. If you are switching from a matte black to a matte black cartridge, or from a Photo black to a Photo black cartridge, you must use an initial fill cycle. If you use flush cartridges as part of the process, you need to use two flush cycles. They may both be the same type or they may be different, depending on the chips on the black cartridges involved. Before proceeding, you must determine which types of black cartridges you have. Refer to Table 1, below, for an explanation of the types of chips on each of the different black position cartridges available for these printers. *The flush cartridges supplied for these printers may either be chipped as Matte Black or as Photo Black. The cartridge will be clearly labeled as to the type of black chip. Use the following steps to switch from your original ink set, to flush cartridges, if used, to the final ink cartridges. 1. Test your printer with Epson inks, and have the proper equipment on hand (see Part I for details). Refer to Table 2 (below) to determine which ink change steps to follow, based on the types of black position cartridges you have. Follow the ink change steps shown in this table for your situation. Table 2: Ink change steps needed for different types of black position cartridges. 3. Perform Ink Change Steps. Use the information from Table 2 to determine which ink change step or steps you must use. If you need to use two ink change steps, use them in the order mentioned in Table 2. Press the Right Arrow button once, then the Down Arrow button once, so the LCD screen reads “Bk. Ink Change” (Black Ink Change). Push the Right Arrow button, so the LCD screen reads “Exec” Push the Enter/Cut-Eject button. Raise the cartridge ink lever, and remove all seven cartridges from the printer. Install only the black drain cartridge in position #1 and lower the ink cartridge lever. The printer will drain all the ink out of the tubes and the print head. After the cycle completes, raise the ink cartridge lever, remove the black drain cartridge, and install the set of seven ink or flush cartridges. Lock the ink cartridge lever. The printer will begin to charge with ink or flush fluid. The LCD screen will display “Ready” when done. If you have just installed the new ink set in the printer, verify that you have a perfect nozzle check pattern, and then you may begin printing. If you have just filled the printer with flush fluid, if possible, turn the printer off for several hours, overnight, or longer, to allow the flush fluid to dissolve any residual ink in the tubes. Turn the printer off, remove the installed cartridges and replace them with the next set. Scroll through the list to the “Cleaning” section. Press the Enter/Cut-Eject button. Scroll through the cleaning list to “init. fill” (initial fill). Press the Enter/Cut-Eject button. The printer will flush out the old set of inks or flush fluid, refilling with the new set. If you have just installed the new ink set in the printer turn the printer back on, verify that you have a perfect nozzle check pattern, and then you may begin printing. If you have just filled the printer with flush fluid, it is beneficial to leave the printer off for several hours, or overnight, or longer, to allow the flush fluid to dissolve any remaining ink in the tubes and print head. Important Note: Do not rely on the “automatic” nozzle check cycle when running Piezography K7 inks. The printer does not recognize the ink densities of the patterns and will determine the print head is clogged, even if it is not. Use the “manual” nozzle check cycle instead. 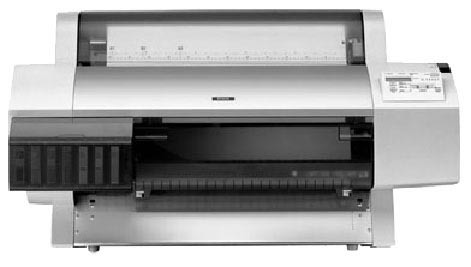 The Epson 7600 and 9600 ushered in the revolution in digital printmaking starting in 2003. No other machine has changed photography so much. The machines are still in operation today and many people use them for Piezography. We suggest you only buy a 7600 or 9600 that is in perfect operating condition. It's not worth the time and effort to resusitate this machine from the dead for Piezography. You can get a 9800 or 9880 (pressurized) printer for the same price most likely. Support is limited for this printer but if you have on that works well keep it! The printheads have a very long life and print at 2880x1440 dpi.